All along its history, the Society of Jesus has given the Church many Saints and Blessed, among whom not a few were martyrs. 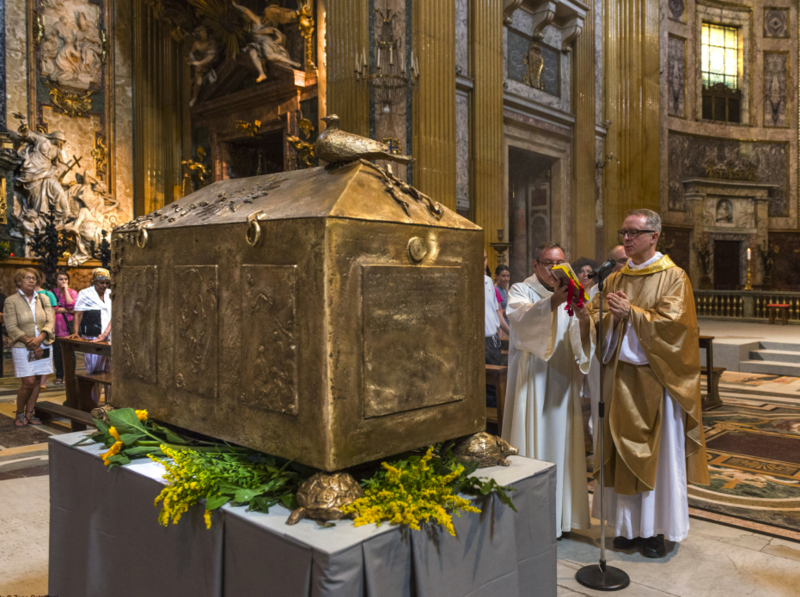 Since the ‘Chiesa del Gesu’’ is the Mother Church of the Jesuit Order, an important number of relics is kept in its sacristy and most of which are kept in very simple containers. With the aim of displaying them in a more dignified way for the respect of the faithful, but especially to emphasise the unity of the body of the Society, we felt the need to place them all in one main chest. This was made possible through the generous artistic work of Maestro Ernesto Lamagna, an Italian sculptor of international fame. The chest measures 110,00 cm in width, 55,00 cm in length and 55,00 cm in height, to which is added a lid in the form of a hut with four slopes 18,00 cm high. The chest rests on four feet in the form of animals representing evil, and more precisely: a tortoise, the symbol of laziness, a toad, the symbol of the ugliness of evil, a reptile, the symbol of temptation and a hedgehog, the symbol of selfish self enclosure. On the main sides of the chest there are six figures (three on each side) in bas-relief representing respectively: on side A, in the centre, St. Ignatius receives the standard from Christ (the theme that recurs in the Formula of the Institute and it is also a reminder of the well known exercise of the second week of the Spiritual Exercises); on the sides there are two other figures which illustrate the particular ministries of the Society as recorded in the Formula, that is, on the left, there is a Jesuit in the act of teaching catechism, and, on the other side, a Jesuit teaching in a school. On side B, in the centre, there is a figure representing Saint Ignatius writing the Constitutions under the gaze of Our Lady of Montserrat; on her left, there is a figure representing a Jesuit hearing the confession of a penitent, while on the other side, another Jesuit who is consoling a sick person. On the minor sides there are another two figures: one is representing the Formula of the vows and the other one, on the opposite side, the prayer “Take Lord and Receive”. On the tent-like hood, the main sloping section, on the side of the opening, carries the Sun (the coat of arms) of the Society towards which flies a swarm of bees suggesting the nectar which will eventually become the honey of consolation; they are the symbol of apostolic labours. On the main sloping section on the opposite side, held by a bent nail, there is a branch with two pomegranates, one of which is open, a symbol of grace which spreads itself in abundance. On each of the two minor sloping sides, there are olive branches, symbolising happiness and peace. Finally on the top of the cover has been placed a dove, symbol of the Holy Spirit, the source of all holiness.